The Real Greg Brady sings with his doppelganger, actor Cory Hansen. 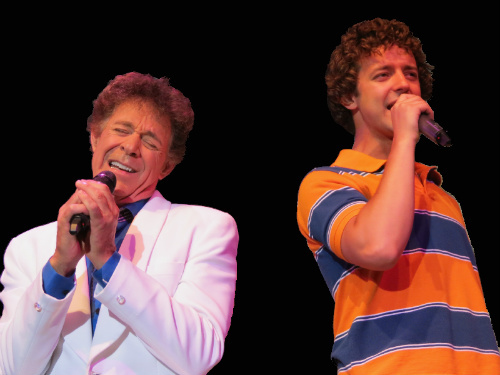 The burden of the eldest child is the yoke of responsibility, and though Barry Williams actually grew up as the youngest of three brothers, he is most famous for his role as Greg Brady, the big brother of the Brady Bunch. As such, he knows a thing or two about the onus of the oldest. “I’m the one who’s carrying the torch,” he observes in the lobby of Yakov’s Theatre in Branson, Missouri, where he has begun a five-year run of a new show called Lunch with the Brady Bunch. Embracing and nurturing his Brady legacy is something that Barry has been doing since penning his bestselling autobiography twenty years ago. Now the man behind Johnny Bravo has moved to the Ozarks and is establishing himself as a permanent member of Branson’s entertainment community. Originally conceived as an adaptation of the cabaret show that Barry has performed around the country for years, Lunch with the Brady Bunch evolved into a program tailored for Branson audiences thanks to a successful trial run that incorporated spectator feedback with advice from theater owner Yakov Smirnoff. The result should please not only Brady fans but anyone with a fondness for the sights and sounds of the seventies and an appreciation of musical theater. The first half of the show is a celebration of all things Brady, beginning with the debut of a new cast of Brady kids. Outfitted in a pastel rainbow of outfits adorned with free-flying, beaded fringe, the new Bradys resurrect some familiar choreography as well as favorites including It’s A Sunshine Day, Time to Change, and Keep On. They interact with the star of the show, referring to him as “Barry” and regarding him as a curious oracle who has the power to reveal their futures. It’s all a bit surreal, with two Greg Bradys on stage and a constant shifting of gears from the fictional world of the Brady family to metacommentary on the lives of its former child actors. It’s also a clever theatrical device that provides a group of talented, young performers who not only back up Barry throughout the show but also exist as cheerful specters of his Brady past. In one inspired sequence, each member of the cast reacts with varying degrees of delight and despair as Barry reveals what the very human actors who first portrayed the Brady kids have experienced over the last four decades. Cory Hansen does a spectacular job of channeling Greg Brady, a challenge that the young actor candidly admits is a daunting task since he appears alongside the originator of the role. He is almost eerily successful both in voice and mannerisms, so much so that audiences may be forgiven for momentarily forgetting that they are living in 2012 and not 1972. Also notable is Lance Allen, who somehow manages to recreate the goofy charm and hyperactive enthusiasm that enabled Mike Lookinland to make Bobby Brady a pesky yet endearing little brother. 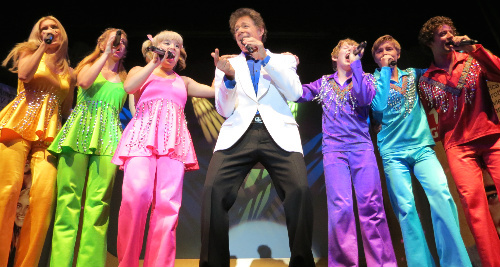 All of the new Brady kids “can sing circles around the originals,” says Barry, and his cast is given ample opportunities to shine, especially in a medley of 70’s classics such as the Partridge Family’s I Think I Love You, the Jackson 5’s ABC, and the Osmond’s One Bad Apple. The first half of the show concludes with an ample lunch made from scratch in the kitchen of Yakov’s Theatre. The auditorium was thoughtfully designed to accommodate the popular “dinner and a show” format, and the staff has the logistics down to a science. Attached to each seat is a swivel-out, lecture hall desk embedded with magnets that hold one’s serving tray in place. While the audience enjoys a satisfying meal of baked chicken, pulled pork, corn bread, baked beans and corn on the cob, Barry and the Brady kids stay on stage and continue to entertain. Dessert (“StrawBarry” shortcake) arrives just after the 15-minute intermission, a sweet introduction to a surprising second half. The Bradys assemble in front of the stage, and young Greg finds himself in crisis, realizing that with all that he has learned so far, he must be nearing the apex of his cherished role as a teen idol. The cast express their sympathies for offstage Barry, whom they perceive as a poor soul whose career is long behind him. It’s a fun setup for a series of Broadway show tunes highlighting Barry’s long and successful run in musical theater. The kids help him don simple costume accessories to enhance his transformation into The Music Man‘s Professor Harold Hill, West Side Story‘s Riff, Oklahoma‘s Curly, and Sky Masterson from Guys and Dolls, all to the tune of highlights from the characters’ respective productions. Barry is truly in his element here, and those who know him only from his Brady work will be impressed by how well his trained voice is suited for Broadway fare. Having thus asserted that there is, indeed, life after (or perhaps alongside) The Brady Bunch, Barry shows a more vulnerable side with heartfelt tributes to his son, Brandon, and to his late father. In offering these revelations from his personal life, Barry sheds the glitz of his teen idol fame and the bravado of his theatrical roles to connect with his audience with unprecedented intimacy. Those who attend Lunch with the Brady Bunch expecting a slickly produced tribute to The Brady Bunch will not be disappointed, but they will also be rewarded with something more substantial. All of the cast assemble in the lobby after the show to greet the audience, sign autographs and pose for pictures. The actors portraying the Brady kids are polite, professional, and every bit as courteous as Mike and Carol would have expected their fictional counterparts to be. As for the Real Greg Brady, he is also warm and approachable, expressing his thanks to everyone who comes out to see his show and asking about their satisfaction with the meal, the performance, and their stay in town. Like Yakov’s Theatre’s namesake, Barry is a natural goodwill ambassador for Branson tourism. What else would you expect from America’s favorite big brother? 2 comments on "Barry’s Branson Bradypalooza"
It was a delight to have you and your family at our performance of LUNCH with the BRADY BUNCH. I am moved by your comprehensive review of the show. I put a great deal of time, care and consideration into the development of the show and clearly you enjoyed the full spirit of the production. Thank you for your insights. As a member of yesterday’s audience, I fully appreciate the hard work that everyone did, who was involved in this show, and 110% agree with Mr. Hunt’s review. I do hope that those who appreciated “The Brady Bunch”, whether they saw the show first-run or reruns, will see the show. You will not be disappointed!